The Carat Project Team at the University of Helsinki, Department of Computer Science, has published a new version of the popular mobile energy-awareness application. After launch in June 2012, Carat has helped over 850,000 users, of which 41 per cent have been Android and 59 per cent iOS users, respectively. The new user interface follows modern application design guidelines and presents battery information in a more intuitive and easy to use manner. Markus Heinonen, Aalto University, on Next-generation statistical learning for synthetic enzyme engineering. 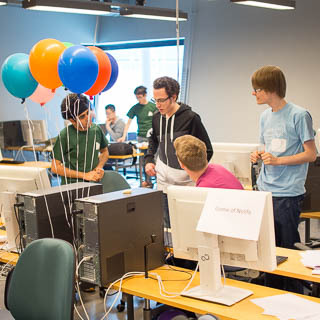 13 teams took part in HIIT Open 2016 programming contest on 28 May 2016 in Otaniemi. 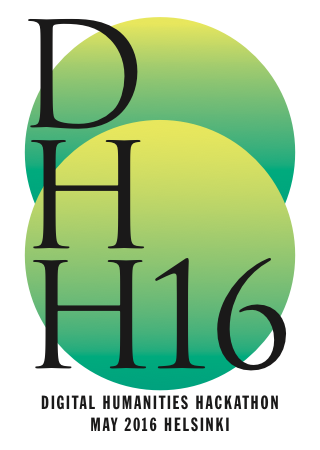 #DHH16 — Helsinki Digital Humanities Hackathon 2016 — was jointly organised by HIIT, University of Helsinki, and Aalto University on 16–20 May 2016. Michael Mathioudakis attended the World Wide Web conference in Montreal to present a demonstration of the GeoTopics system. 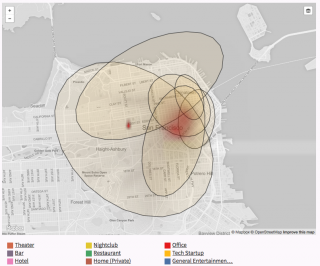 The system processes Foursquare check-ins for large cities around the world and distinguishes regions of different characteristics within them. Helsingin Sanomat, the leading newspaper in Finland, run a full page story of Digivaalit 2015 and computational tools in social science. The story is based on interview with Matti Nelimarkka (HIIT) and Salla-Maaria Laaksonen (University of Helsinki, Faculty of Social Science). They describe details of the methods used to examine agenda influencers during the 2015 elections - results which were published e.g. in Helsingin Sanomat. Researchers in HIIT, CMU, and QCRI use deep-learning techniques and images from social-media platforms to monitor public health. More details are given in this blogpost and the research paper that will appear in CHI 2016. 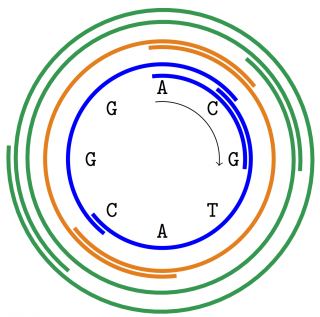 One of the oldest bioinformatics problems is to reconstruct the genome of a species from short fragments, such as those produced by high-throughput sequencing. Due to various technical limitations, it is currently impossible to fully reconstruct an entire genome. State-of-the-art genome assemblers in fact produce long genomic fragments that are "guaranteed" to occur in the genome that generated the data. The Silicon Valley wisdom says that software is eating the world. 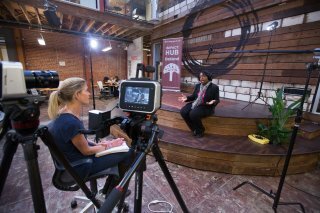 However, in major US companies women are not working on software. Facebook reports 15% of its technical workforce being female, Twitter 10% and the US national avarage is around 23%. This is known as the gender gab in technology fields. Professor Petri Myllymäki, HIIT Director, was nominated as a chairman of Ministry of Education's collaboration forum of scientific computing. The main task of the forum is to steer the activities of CSC. Professor Keijo Heljanko, HIIT programme director, was nominated as a member of the forum.